1. For the crust: Put the pecans, evaporated cane juice, and raisins in a food processor outfitted with the “S” blade, and process until the crust mixture begins to stick together. Press the mixture evenly into the bottom of an 8-inch spring form pan. 2. For the filling: Loosely separate the dates, and combine them with the water in a food processor outfitted with the “S” blade. Process until smooth. Add the cashews and coconut oil, and process again until smooth, about 8-10 minutes. Add the lemon juice, soy lecithin granules, and vanilla extract, and purée once more until the mixture is smooth and creamy. 3. 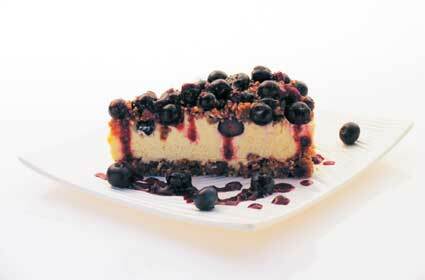 To assemble the cheesecake: Pour the filling into the crust and spread it evenly. 4. For the topping: Spread the cherries over the top of the vanilla cream filling and press gently, so they are slightly pressed into the cheesecake. 6. Store in an airtight container in the refrigerator for up to two weeks.